But as a question about non-design it is a non-challenge: my sins, at the very least, are designed by me. The big theological question is whether, in any way, they are also caused by God – that is, the issue is not whether some things are not designed, but whether some things have two designers. Incidentally I didn’t answer on the thread because it was off-topic (and I was involved in a wedding): off topic because my only previous post on the thread, which was about “poor design”, not “non-design”, was the obvious truth that one cannot criticise a design without recognising it is designed. Just as you can’t criticise sinful acts unless they are acts. Divine Preservation could be considered as a continuous Creation (Conservatio continua creation) whereby all that has been brought into existence from nonexistence, continues to exist and is preserved by the Divine Power that created them from nothingness. Thus, the Creative Action of God brought everything from nothingness into being whereas the Preservative Action of God presupposes their existence. And although in the Creation God Acted alone, in Divine Preservation the creative Action of God co-operates with the laws of nature that He had established so that the Universe will continue without reverting to non-existence. Thus, when we use the term Divine Preservation we do not simply mean Gods consenting to the continuous existence of the Universe, but that through His Intervention, He causes the preservation of the Cosmos, guarding through His Almighty Will not only the whole Universe, but every atom of every element from which the Universe is composed. It is understandable, however, that this Divine Intervention does not exclude the synergy of the natural powers that do not exist independently, but through Gods creative Will. …The Universe is not a mechanical work of art but a living Organism receiving Life from the Source of Life. A branch that is cut off from a tree, withers and dies. In the same way, the world cannot exist without Divine Providence. Undoubtedly, with regard to God, the Governing of the world is inseparable from the Preservation, as both are inseparable from Divine Providence. However, due to our limited understanding, Divine Preservation is distinguished from Divine Governing so that we may examine each aspect systematically. This brings us to my second approach, that of Aquinas, which is quite similar, though he explores a more sophisticated philosophical approach than the idea of “synergy”. His position is that every single event has God as its first cause not in time, but in will. That’s how he can admit the possibility of an eternal creation nevertheless created by God. It also enables him to envisage the products of natural “law”, of chance, and even of human will as being actively designed by God, yet fully respecting their secondary causes. He would answer the challenge about my sinful acts by saying that God created them, though not as sin, but as part of his unfathomable purpose for ultimate good, in no way denying either the freedom or the culpability of my own acts. That’s deep theology, but of course he backs it by Scriptural examples like Pharaoh’s stubbornness serving God’s purpose in the exodus, or God intending the Patriarchs’ mistreatment of Joseph to save many lives. One may disagree with it, as with the Orthodox approach, but one can’t pretend that the problem of evil is an embarrasment to classical theology, which finally places all events under God’s designing will, though by one means or another refusing to allow that God is the author of evil. Aquinas also makes space for “imperfections” in creation whereby things fall below their divinely created nature. But one should note his mediaeval concept that variation is a departure from perfect “form” rather than the expression of God’s creative variety (and the fruitful source of evolutionary change). In any case, such “imperfections”, like all things, remain in Thomas’s view under the control of God’s designing providence. My third approach is biblical, in the Hebrew understanding of creation as we now understand it from ANE studies. As John Walton has shown, the core concept of “creation” in the Old Testament, as in the rest of the ANE, is “assigning function”, rather than “causing material existence.” In other words, what does not have function is not created. And since God is the only Creator, nothing has been created except that which has been assigned a function in his purposes. Or to put it another way, only what is designed exists. Even on a modern materialist understanding of creation, it is hard to understand how something undesigned could come into being from the will and mind of God, and be preserved in existence moment by moment by that same divine will and mind. On the Hebrew biblical understanding, “undesigned creation” is an oxymoron. Furthermore, Divine Preservation secures the natural order and preservation of creatures whereas Divine Governing secures the progress of the Cosmos to its final and perfect end as predetermined by God. You have made some interesting points here and at BioLogos  your comments however seem to agitate a certain beaglelady (I clearly have failed her English tests and am now waiting for my University to remove my PhD, since she has declared I may not be a scientist!). On a more serious note, I think both your approach re an Orthodox viewpoint regarding God as Creator, and my emphasis on the inadequacy of Darwins ideas within the context of a theistic outlook, are pointing the discussion in the right direction. I have considered the evolutionary outlook as either within: (i) such a vast generalisation that it is a vacuous semantic assertion, or simply an ideology that serves the interests of atheists, or (ii) a semantic theory that is constantly changing but accepted as the current paradigm within the bio-sciences. On (i) I have emphasised the importance of Orthodoxy and lament the need by evangelical organizations to somehow find a way to accommodate Darwinism within a theistic outlook. I am certain that a harmony between faith and science, faith and reason, is sufficient for Christians when they consider science and the Biblical accounts regarding God as the Creator. It is this attribute, of the Creator of all, that seems to trouble people who may be theists or atheists  the atheists want to do away with any mention of God, so Nature creates itself, while the theists (liberal) want to find a place for God within what amounts to a view that is harmonised with that of atheists. I suggest a couple of sources that may be of interest to you and others; as a scientist I look at publications in well respected sources and by competent people, and am not interested in theistic or atheistic notions. In Mapping the Future of Biology, a number of authors in this book consider the direction of the Biological Sciences and show, in graphic detail in some instances, the chaotic nature of this area and the numerous controversies that are currently in play. In particular, the notion that the organisms impact on the ecology, and the ecologys impact on the organisms, is a current idea that may eventual lead scientists to re-evaluate the meaning of natural selection as put forward by Darwin. A chapter is also devoted to theistic and atheistic outlooks regarding evolution. The ecological viewpoint however, may be the ultimate battleground for the die-hard Darwinists such as Dawkins, so I anticipate a lot of blood on the floor. Another interesting discussion is found in Rosenberg Philosophy of Science where he discusses, amongst other things, the semantic nature of Darwins ideas and how this results in many debates and controversies. I think these remarks may be sufficient to show that combining our theological outlook with the current thinking of biological evolution is fraught with difficulties and I for one think it unwise to adopt such an outlook. Mapping the Future of Biology looks a comprehensive, but currently very expensive, read. Rosenberg’s seems more easily available. I appreciate your concern not to tie Christian theology to probably changeable science, especially in biology where the state of flux is particularly great, and where the current paradigm owes so much to naturalistic metaphysics. Personally I think there is some value to the exercise of asking “How can these two provisionally be reconciled?”, for example by discussing the relationship of secondary, “natural” causes to God’s primary and final causation. That, I guess, is what I’m attempting in this post to a degree. Many TEs (as well as other people in the fight such as IDers and Creationists and, indeed, biologists) are weak on philosophy of science, as they are on orthodox (small “o”) theology. That results both in heterodoxy and incoherence to a degree that has surprised me over the last couple of years. 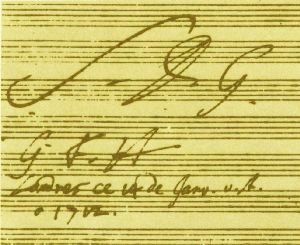 James has pointed out to me that my graphic is signed “GFH” rather than “JSB” – indeed the signature is Handel’s and I misread the original caption. Both men attributed their extraordinary creativity to God. I must tell you that I went and looked up the conversation between you and Beaglelady. It was pretty funny! As for sins and design, isn’t rather that sin is not apart of Creation (and thus design) and rather actually non-creation? Thus, why the Scriptures posit evil and death in the realm of sin, and yet sin is given no real “cause” (besides its origin in the disobedience of Adam). It’s because sin is not-being. I know this is how Augustine articulated it. In that way, my sins are my own. They are acts within providence and yet contrary to Life in Jesus Christ. Don’t know if you wanted to go that way, just wanted to throw my 2 coppers in the ring. Also, I think Bach only signed SDG and never his own name. Might be why it’s harder to find. More profound, the first event of which we know – the setting apart of the Son as our Saviour even before creation itself – deals positively with this nasty thing, whether it’s seen as an entity or a nonentity. By the way, whilst we’re swapping web-sightings, your contributions on the “Collapsing Universe” thread on BioLogos was appreciated here. Since the denial of a cosmic aspect to the parousia appears to have nothing to do with theistic evolution, one wonders why they have added it to their growing list of “dubious or controversial theological positions.” The only motive I can think of is the presumably unconscious support it gives to metaphysical naturalism, which BioLogos denies supporting. Maybe there’s a better reason. “effects” … “contributions were”… must be too much wine over Christmkas. As I understand the matter, Augustine attempted to discuss evil as not something, but rather an absence or removal from God and His goodness. In this sense we may discuss something as being real (God) and not-real (not with God). Sin however, is also stated as breaking the Law; or at least, until the law came, a human being may not know that he or she has sinned. This means that we as self-aware beings, and within our freedom to be and not-be, take on attributes that are equated with sin (or not-lawful attributes). It is in this sense that we may talk of freedom and law  breaking Gods law separates humanity from God, while the law may or may not be known by humanity and with this an understanding (or otherwise) of what is good and evil, with consequential activities of human beings. On the outlook of primary and secondary causes, design and teleology in nature, I think that when attempting to reconcile the teachings of Faith with that of the Sciences, it is important imo to conceptualise human understanding as being within and of nature, while that of God is above and throughout nature (or the creation). In previous times, little was understood of time, space, matter and energy; today we may at least discuss matters that vaguely appear as outside time and space. While such concepts are very blurry, I think that we may progress the discussion of God as Creator and the dynamics of the Universe (and our planet) in a more scientific manner, when these concepts of time and space become better understood. It needs to be said, however, that understanding that God is the creator of all, conveys the meaning that He designs (or wills) it all; this surely states the penultimate purpose (i.e. the creation is purposed by its creator). This however would also be rendered by atheists as purposeless (i.e. no creator means no purpose to it all by definition). The notion that God created all by His Word, and all exists by His will, is obviously articulated as creation and sustaining  my comments are that a scientifically sound articulation may emerge within the Faith-Science dialogue to these general teachings of the Faith. Thus I continue to emphasise the uncertainty and doubt that is present in our current understanding of Science and the way to progress this discussion by starting with certainties that the Sciences have provided todate. Your approach, which seems to address “what can we say with certainty in the science-faith discussion”, lends itself to the purely physical sciences (and maybe ties up best with the sizeable body of people in the debate who are physicists). In the life sciences certainty is intrinsically lower. Even if one could find biological laws, fields like medicine, psychology, sociology etc would evade reduction to such degrees of certainty. So although I agree that there are grave concerns about the veracity of much current evolutionary theory, the problem will remain even if many of those are resolved. Since the less “hard” sciences constitute a very large and important part of God’s Universe, they can’t be ignored. I conclude that a different kind of science-faith agenda is approriate there. Its aims are partly apologetic – to demonstrate that no valid findings of science negate the orthodox truths of the faith. But they can also provide a spotlight for errors not so much in the science itself, but in the metaphysical assumptions made unsconsciously. For example, how is it possible to speak of “Junk DNA” in the light of our discussion above? How can a wise creator create purposelessly, by any secondary process he is sustaining? Maybe we have to cast the net wider for an understanding of “purpose”, but “created purposelessness” (functionless function) appears to be wrong at all levels. The least important aim, in my view, is the correction of theology, though science can validly provoke one into asking new questions. For example the age of the earth is well-established enough now to make theologians examine the implications for biblical interpretation. But that doesn’t mean, as too many have thought, that theology needs to be re-written to comply with the demands of what, as you rightly say, is provisional and in many instances incorrect science. We are in general agreement, and it is refreshing to discuss these important matters in a clear and reasonable manner. The problem with what is intrinsically less certain is that it gives greater room for speculation and also for others to claim expertise, even though such expertise is lacking within the wider context (and is a much more difficult subject) of the Faith-science discussion. To use your example, we start with the dubious assumption of junk DNA, move from this to chaotic and purposeless life-forms, and presto we have theistic statements that do not make sense. I take the view that this willingness to make theology fit in with the latest science (or knowledge) goes back many centuries, and we are still lumbered with the consequences. The age of the earth has never been proven, or measured, from biblical passages, but once someone decides they have a methodology (counting back genealogies, Greek and other philosophers, poetic passages etc.,) then they loudly proclaim an erroneous theology speaking with authority on the age of the earth and biblical accounts. Look at the problems such an approach has created, even though, for example, from the early centuries the Church taught that the Genesis account was not a simplistic statement (i.e. Augustine). Imagine the difficulties people of faith may experience if someone decides that science knows how life originated, and some liberal theologian proclaims this as theological truth? Even though many of us would consider such claims as preposterous, such things nonetheless create many problems. I guess I have made my point on this matter.